The unDX2IO+ Dante™ Audio Interface is a cost effective multi-IO wall box. The unDX2IO+ features two balanced mic/line XLR inputs, two balanced XLR line outputs, and a further two balanced line inputs on de-pluggable connectors on the side of the unit. All inputs and outputs can be used simultaneously and all audio channels are available separately. The unDX2IO+ is designed to fit into all dual gang US junction boxes, mud rings, and old work brackets. 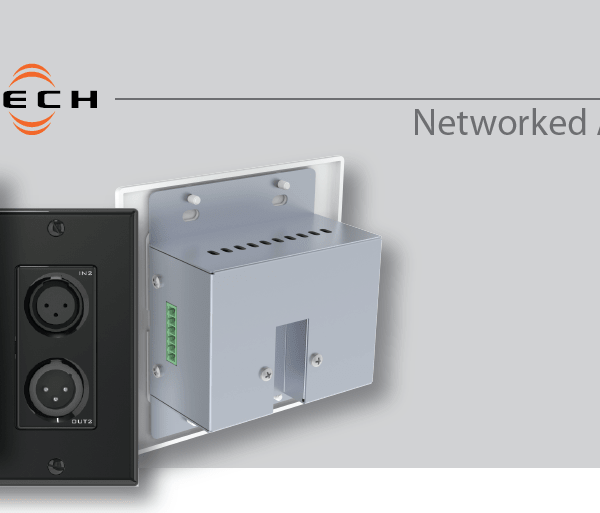 The unDX2IO+ is PoE enabled, so all connectivity (power, control, and data) is provided by a single CAT-5/6 cable. The unDX2IO+’s size and I/O density make it easy to put Dante™ connectivity wherever it’s needed. Easily accessible microphone audio interface for presentation audio systems in meeting spaces, classrooms, theaters and hospitality venues.